AVCHD devices use this “prosumer” format. 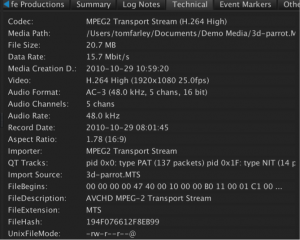 They record H264 video inside an MPEG transport stream and create MTS files on an SD memory card. Our built in player technology has the ability to play back AVCHD files directly within the CatDV interface. No need to generate proxies or rewrap the files. CatDV will read the metadata (rec date, camera model name, etc.) from each MTS file. CatDV 11 can also generate proxies of AVCHD files from the client. Whilst CatDV’s default media library, QuickTime, doesn’t support direct playback of MTS files, applications such as iMovie or Final Cut automatically rewrap MTS and HDV files as MOV which CatDV can play. There are Mac utilities such as “ClipWrap” that will wrap MTS to MOV without transcoding (although some MOV metadata such as record date is not included). Alternatively, if you install the 3rd party Xuggle framework and enable its use via the CatDV preferences settings (download links available at http://www.squarebox.com/mediaframeworks.html) this will allow CatDV to import and create thumbnails from MTS files. Playback can be slightly choppy as this library is mainly designed to let you preview a clip’s contents. One good, proven, solution is to create low res .mov or .mp4 proxy versions of the raw AVCHD files for use within CatDV, and by our optional web interface. This transcoding function can be done using Episode or Rhozet or FFmpeg.